So on Friday 28th August I had tickets for me and my sister to see Hamlet. I bought these tickets over a year ago on 11th August 2014 – so as you can imagine this was a highly anticipated day out! We then took a gentle mooch round London – with a visit to Tiger and the huge Paperchase, where we stopped and had a beverage, charged our phones and generally nattered without interruptions of “Muuuummmm!” every five seconds, it was heavenly. I used the facilities in there and it was like stepping into a nightclub – the décor was black and the lighting was Blue or UV all it was missing was the boom boom of the music!!! Slightly bizarre! I took my Digital SLR with me and manage to take a few photos around town too, which was great. and some more because I couldn’t choose! Then we made our way over to the Barbican – we went by bus. Once there we purchased some nibbles in Waitrose, with my weird and wonderful eating restrictions I went for Tyrell’s vegetable crisps and some gluten, lactose and gelatine free cola bottles (they are quite yummy!). Then it was off to the Barbican Centre. It starts two months after the death of Hamlet’s father, King of Denmark, and Hamlet is to attend the wedding of his mother (Gertrude) and his uncle (Claudius), the brother of his father. His uncle is now the new King. The Queen and King request (order) that Hamlet not return to university. He is none too pleased but does as he is asked! Two of the palace guards come to Hamlet and Horatio (Hamlet’s friend) to report that they’ve seen a spectre that appears to be the ghost of the dead king. So that night Hamlet joins them and sees that it is his father. He follows the ghost, who eventually speaks to tell Hamlet that he was murdered by none other than his brother Claudius – Hamlet’s uncle the new King! He wants Hamlet to avenge his death and kill Claudius, and not to forget him. In the meantime, Ophelia, the object of Hamlet’s affections, has been told by her brother Laertes to not believe Hamlet’s professions of love. She also has a scene with her father, Polonius, who also tells her to make herself less available to Hamlet. Hamlet, after the revelation of murder by his ghost father which he obviously keeps quiet, seems to his family to have lost his mind/be in a deep depression, which they put down to the death of his father. Ophelia goes to her father, Polonius, saying Hamlet has come to her in a state, giving her a letter proclaiming his love. Which Polonius takes to Claudius and Gertrude, to basically say that Hamlet has gone mad because of his unreturned love for Ophelia. Claudius and Polonius plan to have Ophelia talk with Hamlet, whilst they hide but listen in. Which Hamlet figures out and goes off angrily. Gertrude and Claudius arrange for Hamlet’s friends, Rosencrantz and Guildenstern, to try and lift his spirits. Some actor’s come to the palace to put on a play – in which Hamlet requests they insert an additional scene, which he had written to try and trigger a reaction from his Uncle, showing his guilt for the crime – which is exactly what he does. Gertrude was speaking with Polonius, who hides when Hamlet comes in where Gertrude confronts her son demanding to know what he was thinking. Where he starts to speak with her and hears a noise believing it to be Claudius he goes to Polonius’ hiding place and takes tragic action and stabs Polonius to death. Aghast at his actions – he continues to describe the situation to his mother, to keep herself away from Claudius, she is very distressed. Hamlet then removes Polonius’ body. Claudius comes in to find Gertrude and asks her what has happened, and she says what Hamlet has done. The palace then search for Hamlet and capture him and he is bought before his uncle. Who banishes him to England – rather than kill him, for the sake of his mother. This was the end of the first part. The King receives his letter where Hamlet has written that he is returning. In the meantime we see Ophelia who has lost her mind with the grief at the death of her father, Laertes also returns initially blaming the King for his father’s death. Claudius tells Laertes what actually happened to his father, that Hamlet killed him, and traumatised by the effect of the death on his sister he agrees to a plan to kill Hamlet with Claudius. Ophelia, so overcome with grief takes her own life, by drowning herself in a lake. Hamlet and Horatio come across the gravedigger, unaware the grave is for Ophelia, and this is where we have the ‘Alas, Yorick, I knew him well’ speech, and then hiding in the shadows they realise who is being buried and how sorrowful Laertes is. Hamlet reveals himself, eventually it all results in a fencing match between him and Laertes. Three touches and you’re the winner. What Hamlet is unaware of is that the rapier Laertes is using is laced with poison as is the goblet of wine the King keeps offering him. Laertes manages to stab Hamlet with the poison rapier but Laertes is then stabbed with the same rapier by Hamlet. Hamlet’s mother drinks some of the poison wine and collapses down dead. Laertes, knowing that he is dying, tells Hamlet of the plan with the King, so Hamlet manages to stab him and make him drink the wine before he succumbs to the poison. So Hamlet, Laertes, Claudius and Gertrude all die – leaving just Horatio to explain the story of what has happened to the royal family and Fortinbras returns to assume the throne. Apologies if any of this is in the wrong order, or slightly incorrect, as I have only seen the show once, but quite nice to get it down as I understand it. If you get the opportunity to see this production go for it, it’s absolutely amazing! I loved it. Afterwards we did wait by the stage door to see if we could manage to get a glimpse of Benedict – I also got a high five from Matthew Steer who plays Rosencrantz. 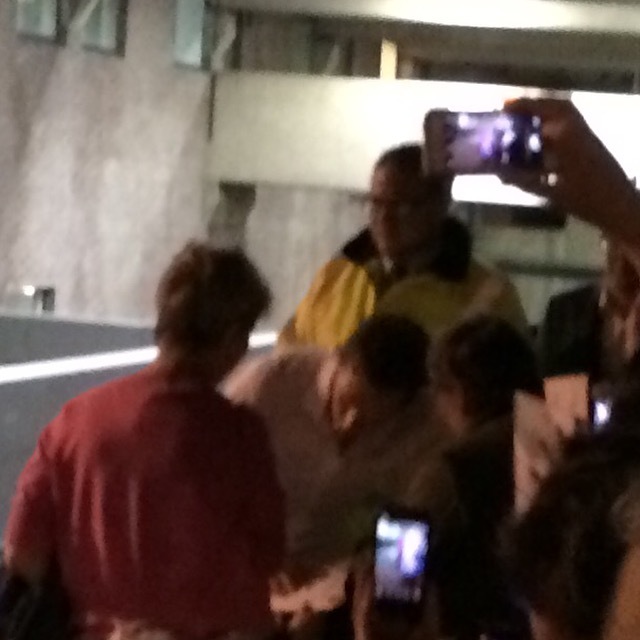 I did get an extremely blurry, distance photo of Mr Cumberbatch. I promise the blurry man in the white shirt is Benedict Cumberbatch!!! As we started our walk to make our way home my sister and I met the lovely Kobna Holdbrook-Smith (Laertes) and spoke and had our photo with him. My sister likes listening to the audio stories, the Peter Grant series by Ben Aaronovitch, that Kobna narrates. He was very charming and made for pleasant end to our Barbican experience.